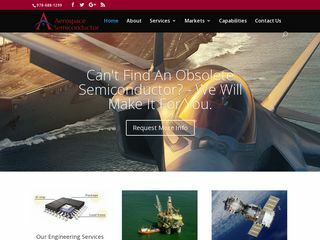 Aerospace Semiconductor, Inc. designs and manufactures quality hybrid microelectronics, custom semiconductors and provides semiconductor packaging services. Our circuits are used wherever space is at a premium, harsh operating environments exist, high reliability is required or a customized package can lead to improved circuit or thermal performance. We also design and manufacture drop-in replacements for electronic components which are obsolete, hard to find or no longer commercially available. We consider our unique combination of circuit design capability and process know-how critical to the successful delivery of microelectronic solutions. We utilize appropriate technologies for the requirement, as dictated by the criteria of performance, cost and sound engineering judgment. We can start from an existing design, a schematic which needs to be miniaturized or improved, or a concept that needs to be realized from scratch. We are also able to test products against a full suite of electrical and environmental testing requirements.